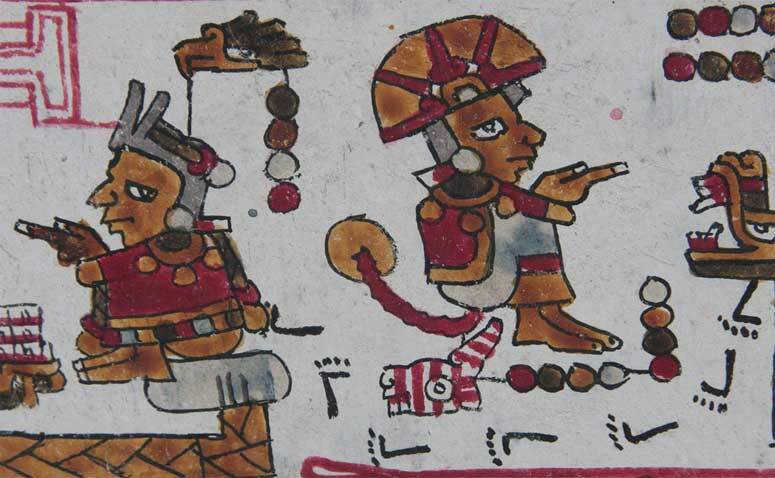 The ancient Mesoamerican codices are amongst the rarest books in the world. Less than twenty still exist in the entire world. In them we find – amongst other things - the histories of the Mixtec people, the rituals of the Aztecs, and the calculations of time of the Maya. Even though these books have been studied for their content for over a hundred years, we still don’t really know how they were made. We, an archaeologist and a chemist from the Netherlands, teamed up to try and understand this production process better, by making our own codices using the right materials (pic 1). 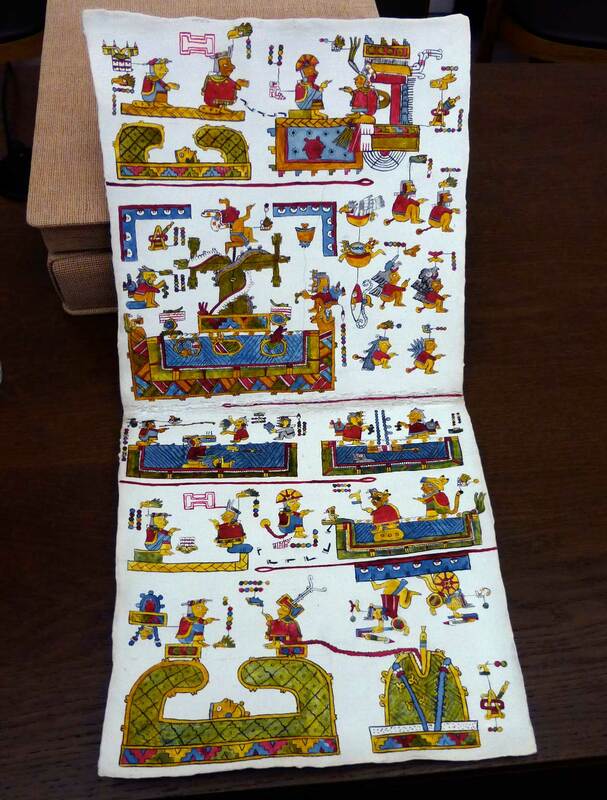 It is clear that the precolonial Mesoamerican codices were made with materials that were not commonly used to make European books. Their main components have been identified by international teams of researchers that used high-tech machines to identify materials without damaging the objects. We know that the ancient scribes glued together sheet of leather or bark paper to form the basis of their manuscript. This was folded like an accordion to make the pages and the whole was covered in a gypsum or chalk gesso. This made for a bright white background on which the scribe could write either in hieroglyphs (in case of the Maya) or in pictographs (for the central and southern Mexican cultures). A range of brightly coloured paints was used to make the figures. What was in those paints has been very difficult to figure out. For many we only know that they were made with organic materials. Luckily, there are Spanish colonial sources that describe what plants were used to make colours (pic 2). 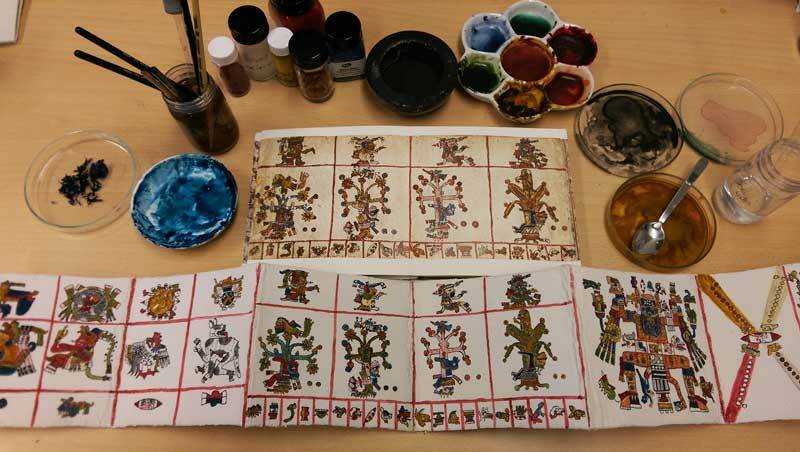 Combining this with present day local knowledge of plants makes it possible to create a list of basic ingredients for the making of a precolonial Mexican book. Working with these basic ingredients is not always as simple as it seems. 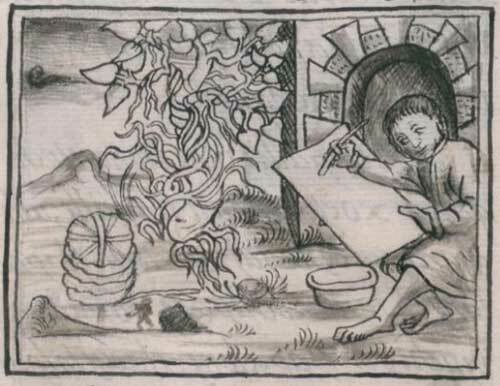 For example we know that many Mesoamerican scribes used cochineal to make a red paint. 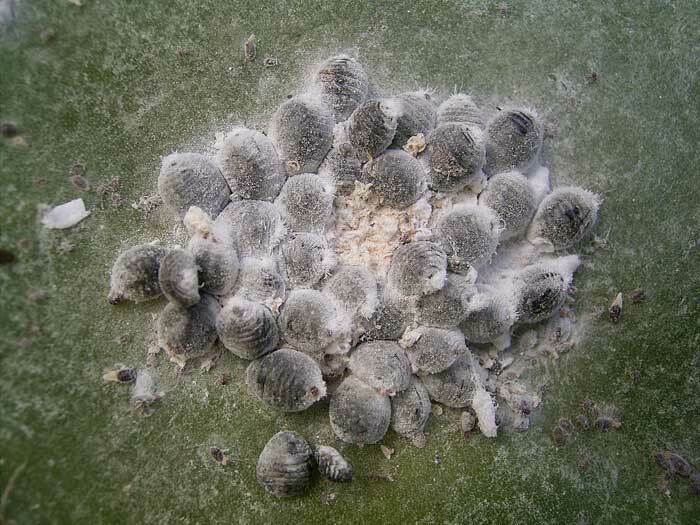 Cochineal is extracted from cochineal lice that live on cacti (pic 3). Inside the body of the female bugs large concentrations of carminic acid can be found. This substance is bright red. In fact this red is so bright that everyone who has eaten a red M&M has without knowing it been eating insect colourant. Not to worry though, it is completely harmless and one of the best and widespread natural red colourants. In order to extract the dye from the insects, they were first roasted and then ground and boiled to release the colourant. Sieving then removes the rest of the insect and what you are left with is a purple- to red-coloured water (pic 4). Here is the problem though: if you apply this red water to a surface, it will immediately become black when it dries. This is because the carminic acid is not very stable and it needs added chemical substances to stabilize it. One such stabiliser, the one most likely used in precolonial times, is alum. This aluminium compound can be found as a mineral, but can also be extracted from certain plants. 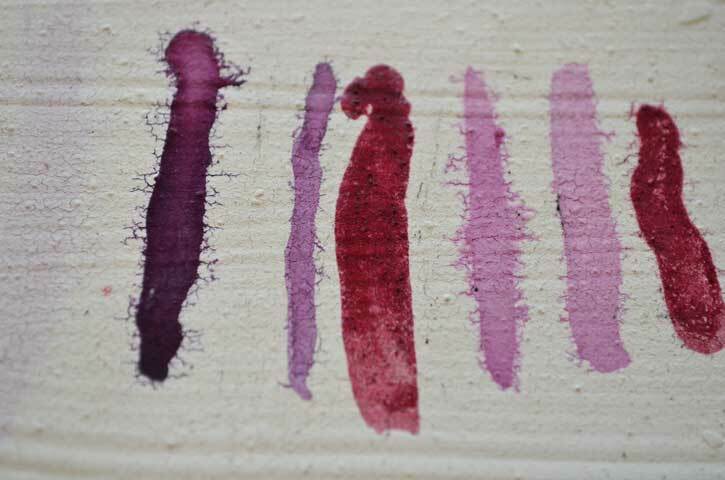 While the addition of alum stabilizes the colour of the cochineal paint, it also changes it to a more purple colour. This is because cochineal is not only rather unstable, its colour is very much dependant on the acidity of the solution it is made in. So in order to make a bright red and stable cochineal paint, you need more materials than just the bugs and some water. For these experiments we made a series of paint outs (pic 5), which are small test samples containing the different paints we made with which we could do some more experiments. These samples were subjected to different processes that could damage the paints, such as water, light and friction. These forms of artificial aging helped to better understand how the paints would behave in the long run and thus which materials were the most likely to have been used in the production of the codices. Close inspection of some of the codices shows for example that their creators used a blue paint that faded over time (pic 6). This same blue was used to make green by applying a layer of transparent blue over a layer of yellow. The fading of this blue has dramatic effects for the present-day visual effect. In order to make our “full-scale” replicas we started off by cutting sheets of deer leather to size. These were then covered on both sides with animal hide glue to make the support more rigid. This was done to prevent the bending of the surface, which would have caused the gesso which was applied to this leather surface, to break off. Multiple thin layers of the chalk and gypsum surface were applied in alternating directions to give the surface more strength. 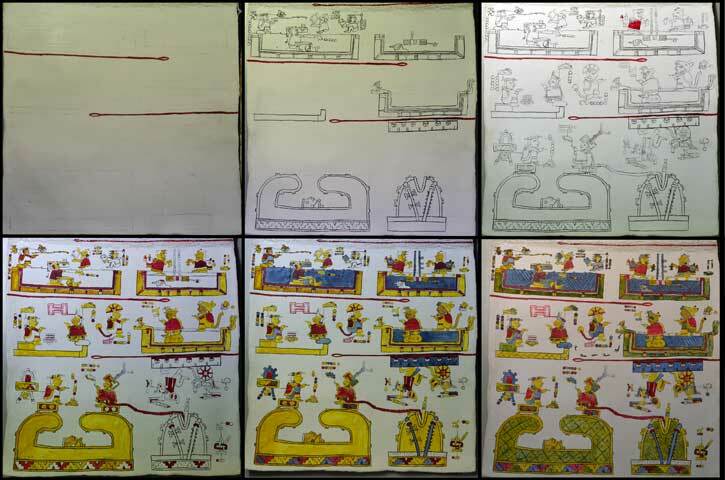 Because of time constraints we did not replicate entire codices, but concentrated our efforts on sections of three codices; six pages of the Codex Tonalpouhqui (Vaticanus B), two pages of the Codex Ñuu Tnoo-Ndisi Nuu (Bodley) and two pages of the codex Añute (Selden). On the first two we used carbon paper to first trace the outlines of the figures, while on the last replica I used a more authentic process. Here I first divided the page using a watered down cochineal. With a series of squares indicating the position of large features the general composition was laid out. After this the outlines of the figures were drawn using carbon black ink. Once these were dry, they could be coloured in using four colours: a yellow made from a plant called zacatlaxcalli (pic7r), cochineal red, blue or matlali made of Commelina coelestis flowers (pic 7l); and green made by applying a layer of matlali over zacatlaxcalli. After everything was coloured in, the outlines had to be retouched in places where the colour paint had gone over the line to make the whole work look neater. The end result has an almost shockingly colourful look to it that we would never expect when looking at the present day state of these books. But the making of the reconstructions not only taught us about the original visual impact of these books, we also got valuable information about the process itself. One aspect that had us worried for example was the making of mistakes. When drawing with the carbon ink however it was very easy to correct mistakes, as a sharp tool - like a flint blade - could be used as a very effective eraser that left no trace of the correction. It also showed something of the amount of people, objects and materials that had to be involved to make a codex, to say nothing of the investment of time. It took us as novice scribes over a month to make the blank supports and over 40 hours to draw just two pages. This experience left us with an even deeper respect for the skills of the precolonial Mesoamerican peoples. All images courtesy of, thanks to and supplied by Ludo Snijders, except for pic 9: photo by Ian Mursell/Mexicolore. Great article! Any chance you can upload higher res images of the final color reproductions?